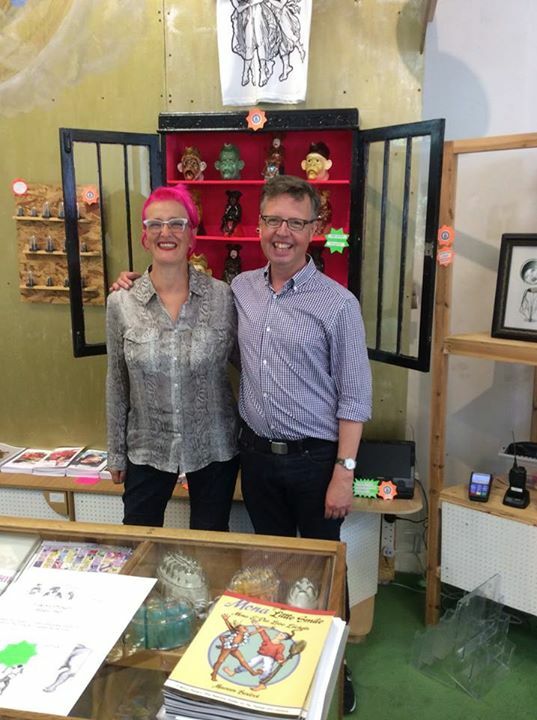 Maurice's Blog › “Cockadoodle” Lands at Space Station Sixty-Five in London! 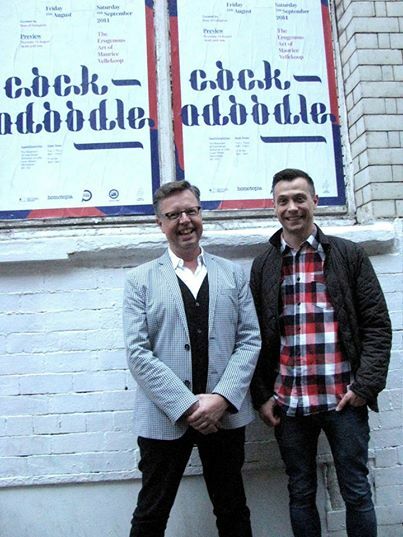 Here’s a picture of me and my fabulous, multi-talented curator, Bren, outside the Manchester venue, from last August. This is the guy who, after a chance meeting in Toronto, became interested in my work and, possessed of that magical combination of imagination and a Protestant propensity for hard work and getting things done, made all of this possible. Love you, Bren, and many thanks!! And here’s me with one of the divoon Space Station Sixty-Five curators, Rachael House, whom I met last summer while traveling around the UK. She, along with her partner, Jo David, kindly invited me and my work to their marvelous space in Kennington. (Rachael and I immediately bonded over a mutual obsession with the Scottish punk band, The Rezillos!) Many, many thanks, SS65ers! So excited to see all my new English friends again. If you are in London, please come out to the opening: all are welcome! This was written by admin. Posted on Wednesday, January 14, 2015, at 3:52 pm. Filed under Uncategorized. Bookmark the permalink. Follow comments here with the RSS feed. Both comments and trackbacks are currently closed.